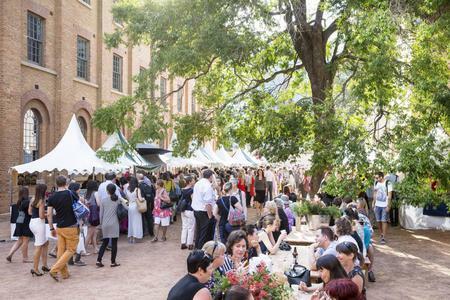 Head over to the world heritage listed Hyde Park Barracks for the annual Christmas Fare. There will be more than 40 fabulous market stalls featuring a hand-picked selection of delights from Sydney's finest artisan producers, makers and small-scale retailers. If your Christmas feast consists of all things baked, glazed or smoked then this is the place to buy the tastiest high quality fare. Keep your eyes peeled for Black Star Pastry, Brooklyn Boy Bagels, a favourite pickler - Cornersmith, sauce and condiments galore such as from the likes of Handsome Devils Co. You'll also find mouthwatering salted caramel from Cicada Chocolates, boutique meats from Feather and Bone, cultured butter from Pepe Saya, gourmet salts from Olsons Salts, and tea drinkers can rejoice in tea from merchants, T Totaler. These are just a few of the stalls. It's not only about food, there will also be stalls with a curated collection of homewares, furnishings, knick-knacks and accessories such as those from Forage and Find. Foodies will be in heaven, finding the most delectable artisan fare for your Christmas table. These wonderful stalls offer a variety of special items perfect for Christmas feasting or as gifts. Take advantage of this opportunity to enjoy the excitement of Christmas in the beautiful surrounds of Hyde Park Barracks Museum. There will be free museum entry, festive drinks at Young Henry's pop-up bar, plenty of delicious dinner snacks from ready-to-eat food stalls and festive live entertainment by emerging local talent. Entry via gold coin donation would be appreciated.